LEAD BOOKER MUST BE PRESENT. ID REQUIRED. 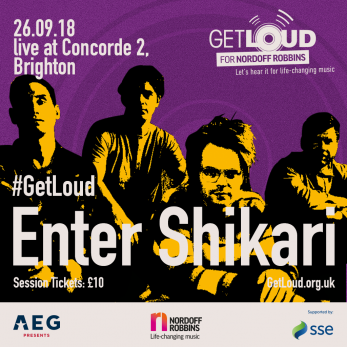 Get Loud for Nordoff Robbins: Enter Shikari at Concorde 2. Nordoff Robbins, the UK’s largest independent music therapy charity, is proud to announce the return of their ground-breaking Get Loud campaign which is supported by founding sponsors, SSE. Taking place on Wednesday 26th September Get Loud will present ten celebrated UK artists performing at the same time in ten intimate locations around the UK. The eclectic range of artists performing this year are helping Nordoff Robbins celebrate the incredible diversity of their charity, as they reach out to anyone and everyone who can be helped by music therapy. At Nordoff Robbins, everything we do is about people and music. We celebrate the connection and joy music can bring to those with life-limiting illnesses, physical disabilities or emotional challenges. As the UK’s leading independent music therapy charity, we offer vital support through our dedicated open access centres and alongside over 150 partner organisations. Get Loud is our national awareness day, when we shout loudly and proudly about the incredible work our music therapists do every day to help change lives. All of the money we raise is from the generosity of the public and through fundraising at our events, as we don’t receive any government funding. Please donate here to help change someone’s life through music.